Hello! 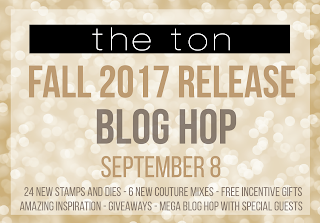 I am thrilled to be joining The Ton for their Fall 2017 Release blog hop! They have some stunning new holiday products that I am really looking forward to using for some of my Christmas cards and projects! For my first card I used the gorgeous new Holly Branch set. In this set, there are the outline stamps which I used here, and there are also solid stamps you can use along with the outlines or by themselves. I stamped everything in waterproof black ink and watercolored it with Peerless watercolors. After everything was dry I splattered some of the same color green watercolor paint around. 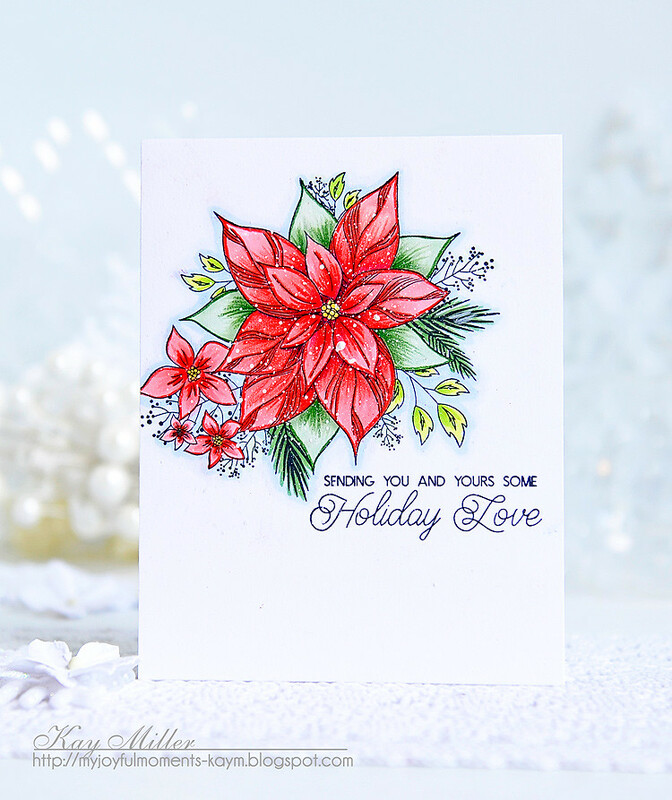 For my second card, I used the Holiday Love Poinsettia stamp set. I stamped it with black ink, then colored it with a combination of Copic markers and Prismacolor Colored pencils. After I was done coloring, I splattered it with some white acrylic paint. Below is the line up for the hop if you have just happened by my blog. If you've been following the hop, I am the last in line! These cards are wonderful. Love the new stamp release. Stunning! Awesome projects, I have no other words for these fabulous cards! Wonderful cards ! I loved the brightness..
Wow, what gorgeous cards. They really pops out at me. Another fabulous release by The Ton. Beautiful cards, beautiful coloring, lovely backgrounds, loving the splatter! You work magic with Peerless watercolors, Kay! Beautiful projects as always! Bright and merry! Did you paint a blue sky behind parts of the branches? It looks like blue, as well as green, is splashed onto the card after painting. It is gorgeous! Gorgeous cards! I especially love the pointsettia card! These cards are just the most beautiful ever!!! Pretty stamp set and wonderfully done cards. Love how you water colored both of them. EXQUISITE! Beautiful coloring on both cards! Such a great release from The Ton! Love both of your cards, great coloring! Beautiful cards! Glad I got my shopping done early. Both your cards are gorgeous but the first one Holly Branch is perfectly perfect. Beautiful stamps. Oh Kay, these are totally fantastic. OK, so I am NOT making duplicate Christmas cards this year. After seeing this hop I have too many ideas. TFS! Awesome cards-love the touch of blue with the holly leaves! These cards are gorgeous. The water coloring over the ivy is inspirational. Thank you for sharing. Beautiful cards! Especially the poinsettia with snow! Thank you for sharing. Beautiful cards!! Love the splatter on both the cards. The poinsettia card is my favorite!! Love the cheerful colors. Beautiful cards. The holly is one of my favorite stamps and I love your design and coloring. Beautiful cards, color, and spatters. You've really showcased these stamps. These are beautiful cards. Your coloring skills are amazing. These are gorgeous cards! Your watercoloring is awesome and I love the Copics enhanced with colored pencils. Very gorgeous cards !! The colors on the first one are awesome ! Lovely cards. Thank you for sharing your creativity with us. LOVE how you finished off your inky holly branches and vibrant poinsettias with splatters, it gives them a MAGICAL finish, perfect for Christmas! These are gorgeous! Love the colour shades you used. STUNNING! LOVE how you colored that holly card! Gorgeous cards Kay! Both of these cards are STUNNING!!! Love everything about them!!! 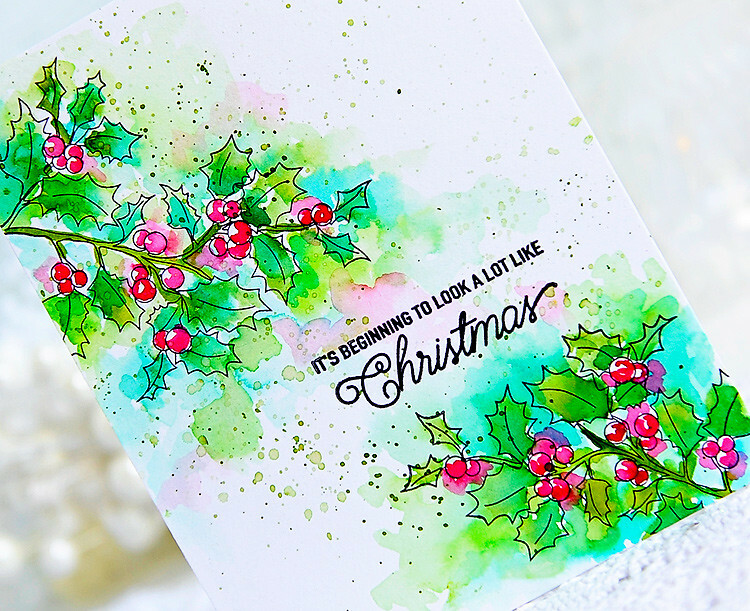 Love the watercolor on the holly branches card. Really lovely. Both cards are pretty but the poinsettia is my favorite. Kay, your projects are amazing!!!! Stunning cards. Great colors and card designs. The Ton has release a fabulous release! Nice job. Your cards are beautiful. I love the splatters. Thought cards are INCREDIBLY GORGEOUS! REFINED to Hallmark, framming quality! I'm in Awee. Oh my, Kay! Absolutely gorgeous and, as many have mentioned, creations to be framed! I don't have any products from The Ton in my collection, but after seeing your cards, this 'has' to change! Fortunately, a local scrapbook supplier will be ordering from them; she's invited us to send our requests her way. I'll be sending, for sure! WOW! Kay your designs are gorgeous! as many have said, these creations are frame worthy!! They would make a wonderful wall embellishment! Thanks for the fabulous inspiration! Have a lovely day! What pretty colors! Love the white splatters! I like the colors on your cards. Your Holly Branch card is so pretty. You did a wonderful job watercoloring it! 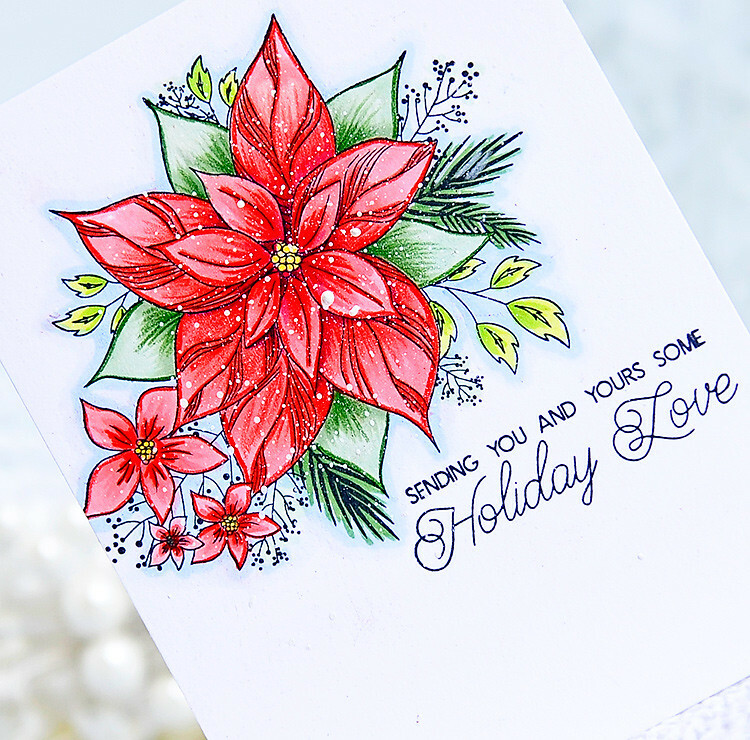 I also love your poinsettias colored with Copics and colored pencils. It is a beautiful card, as well! Gorgeous cards! Love your beautiful coloring! 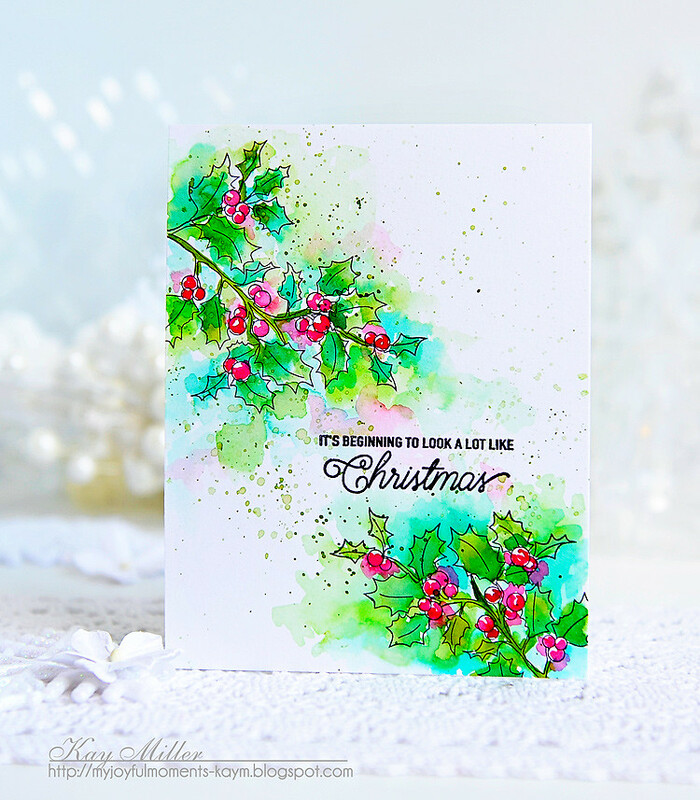 The holly branch design is a favorite! Wonderful cards! Love the ink splatter on the first card. This poinsettia card is gorgeous! Both cards are so beautiful! Thank you for sharing. So pretty and festive. Beautiful watercolouring. Awesome designs. Lovely cards and stamps. Just fab! Loving Christmas in September! Love your cards and skillful coloring! Just gorgeous! Beautiful! Both cards are wonderful! Thank you for sharing them. Gorgeous!!!! And your making me spend money lol!! Amazing colouring and I esp. love those splatters on the poinsettia. Thanks for the inspiration!